Nelson Mandela once said that education is the most powerful weapon which you can use to change the world. Everyone is looking to change the world and why not take a part in this movements. People are paying ridiculous amount of money for education and this industry is valued at $3 trillion. Most of this amount is now spent on online education and course and we would like to give you an opportunity to take fraction of this market. The best way to start is to create your own education related website. The best and by far the most popular CMS platform is WordPress and it could be used to make your own education related website with ease. Diplomia is the new sensation among teachers and schools! 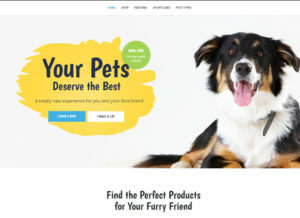 The developers created this WordPress theme with lots of care and users experience in mind. It is completely responsive and works on all devices and screens. 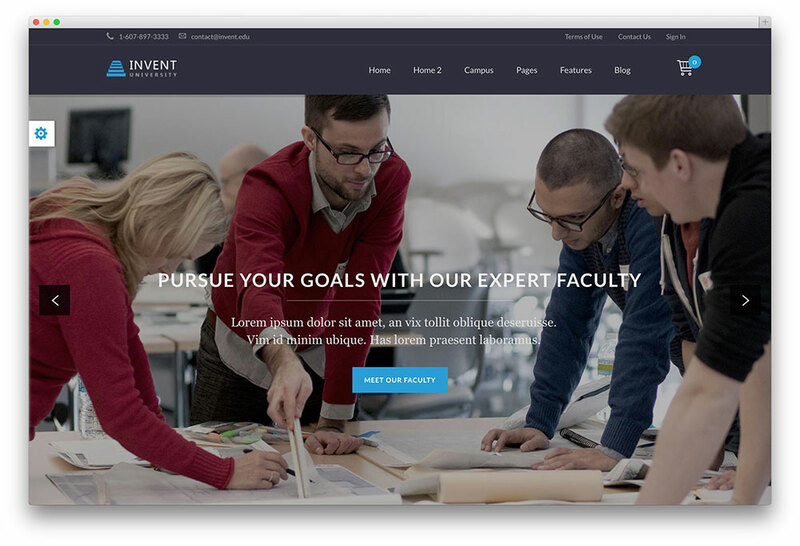 Invent is a clean modern WordPress education theme with unique look and feel. You can use this theme well with school, college, university and other education related websites. 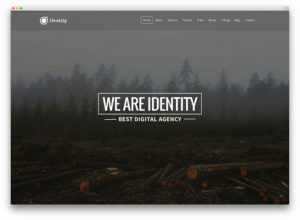 While this this theme is ideal for educational institutions, you can use this flexible theme for creative digital agencies, corporate and portfolio websites. 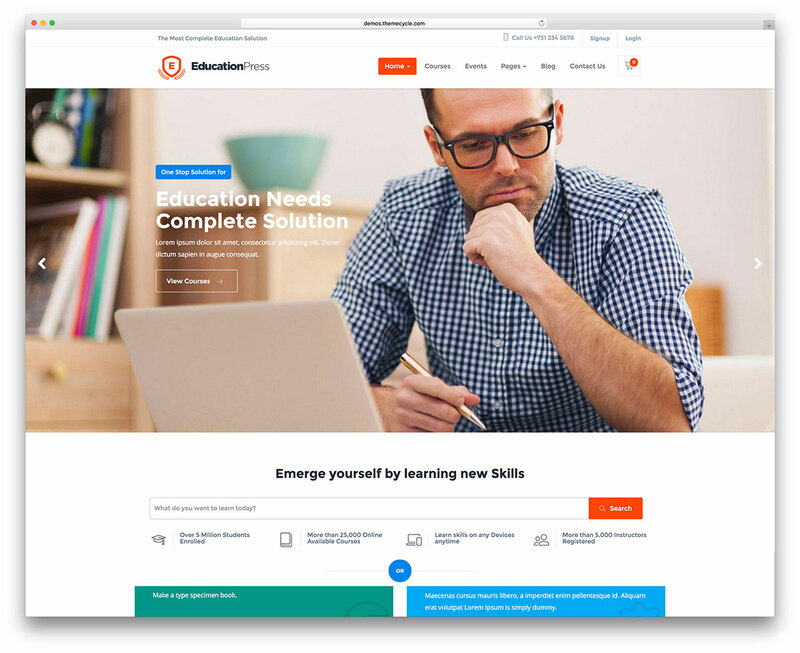 EducationPress is a useful and convenient, time-saving and robustly constructed, speedy and readily responsive WordPress educational LMS website theme. 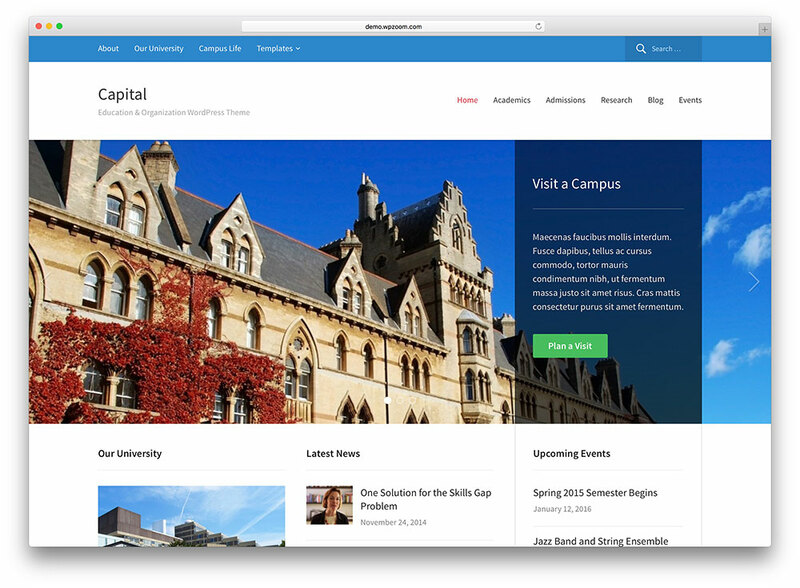 Capital is a very powerful, extremely flexible, professional looking WordPress responsive multi purpose theme, well suited for the needs of a multitude of websites, from corporate to business to personal, yet peculiarly well built for the needs of educational organizations’ websites. 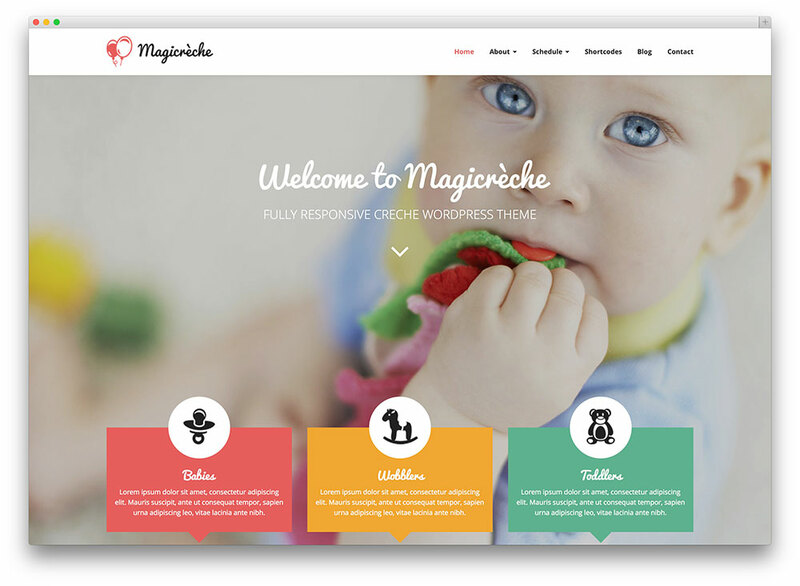 Magicreche is a clean and beautiful theme for schools, kindergartens and other education related websites. Using the Bootstrap framework, the creators optimized this theme well to suit smartphones and tablets. 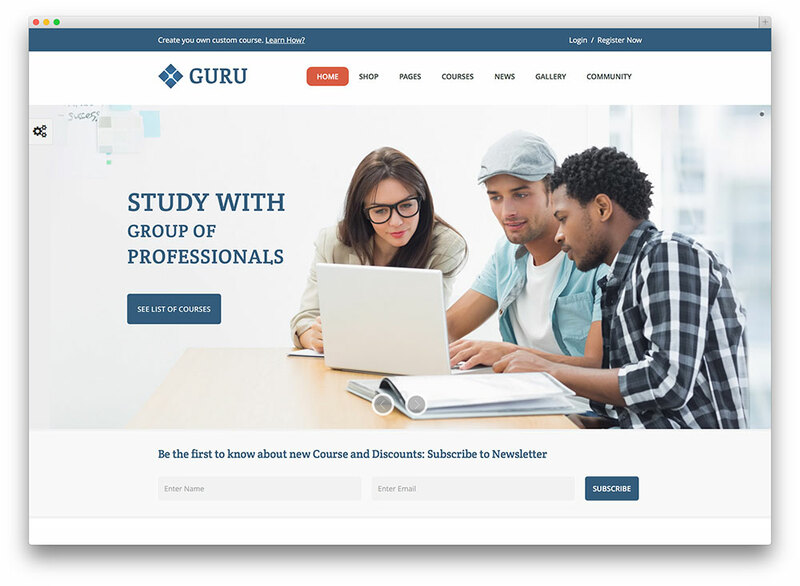 Guru is yet another beautiful multipurpose WordPress education theme with a built in support for bbPress, BuddyPress, WPML, Events Calendar, WooCommerce, WP e-Commerce and many more. 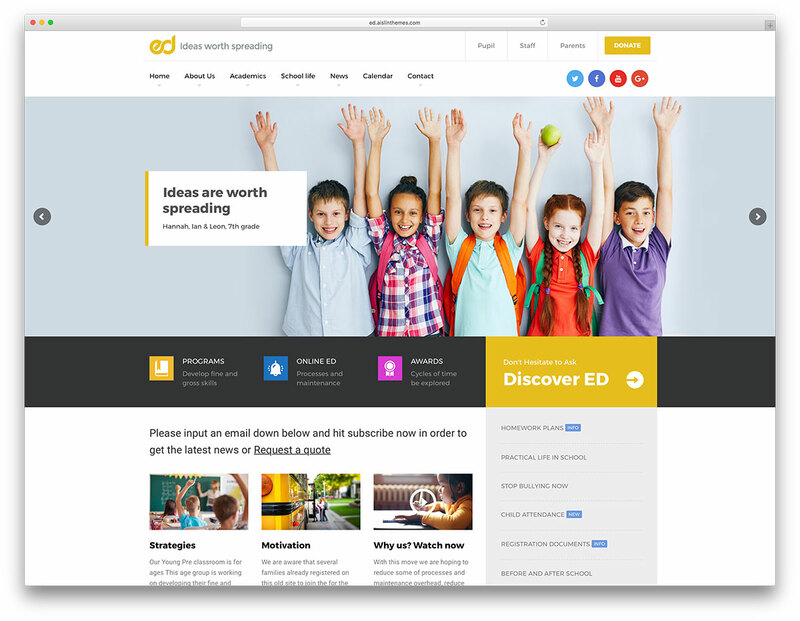 Ed School is a kids and adolescents WordPress theme that specializes in education. It suits easily levels from elementary, middle and high school. Kalium is a robust and reliable, colorful and youthful, clean and pristine, easy to use and readily responsive WordPress creative website theme for professionals. Kallyas is an intuitive and responsive WordPress creative multipurpose website theme. This theme is a pliable platform for creating all sorts of websites. 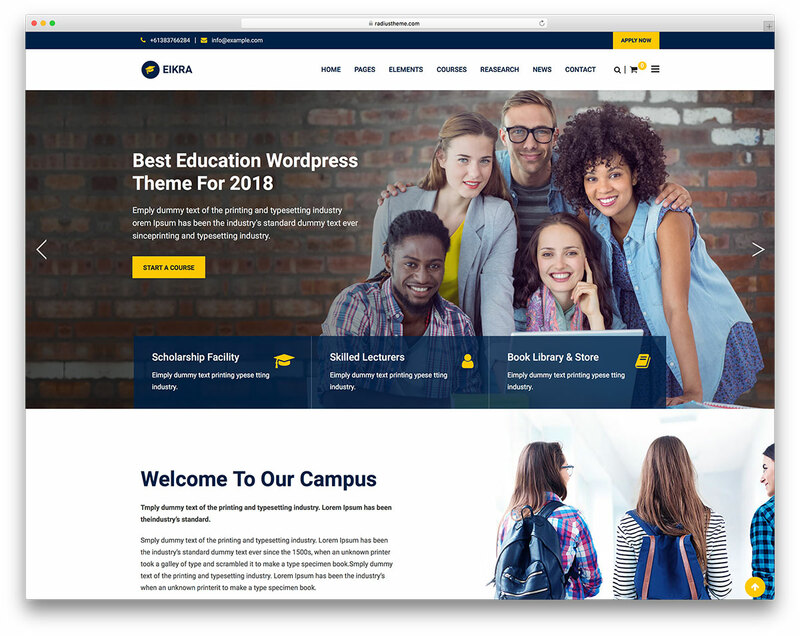 Upside is a clever and insightful, visually impressive and very fresh-faced and youthful, robust and reliable, readily responsive WordPress multipurpose education and medical website theme. 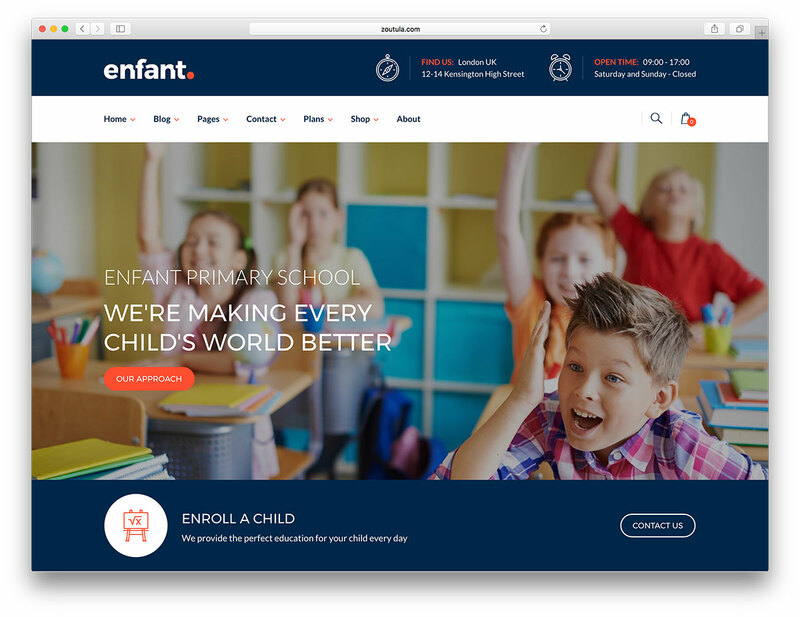 Enfant is a School and Kindergarten WordPress Theme. It is high quality product designed with tons of premium extensions and compatibilities. It offers three demos that specialize in different educational levels or areas. 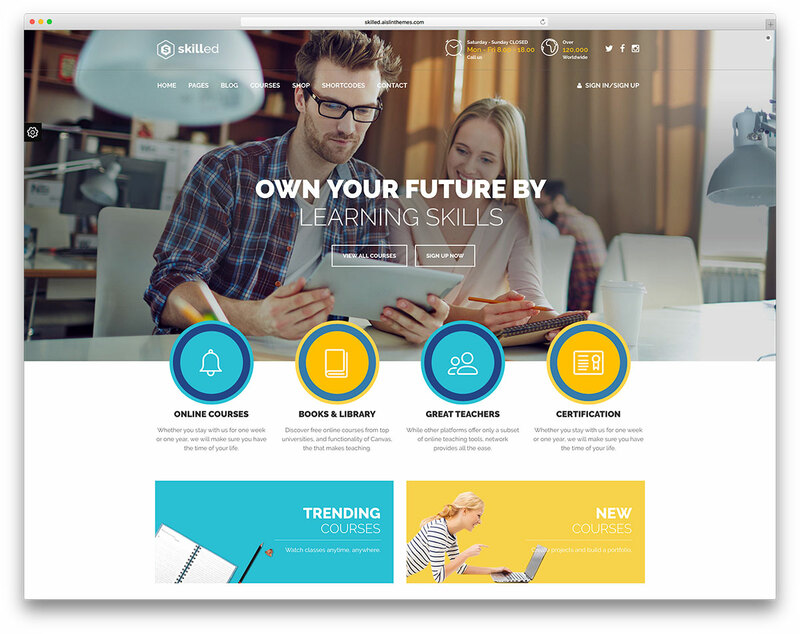 Skilled is an attractive and visually intuitive and well structured, easy to use and highly engaging and modern, readily responsive WordPress school education courses website theme. 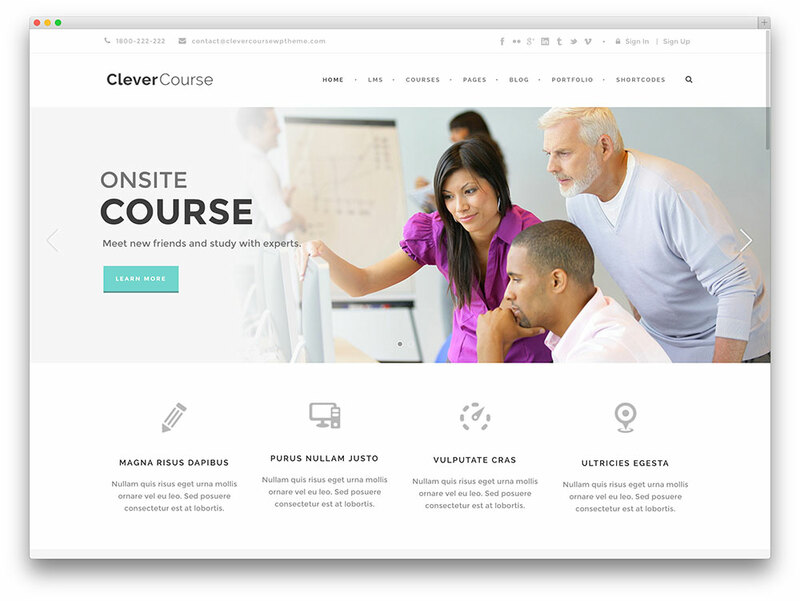 Clever Course is an awesome WordPress theme, ideal for customers who wish to create an informative and effective education web page. The creation and commercialization of online courses has become a very lucrative business, and you can use this theme to establish a respectable source of information for students. Varsita is a superbly well built and very reliable, interesting and visually stimulating and attractive, youthful and fresh-faced, creative and cutting edge, innovative and imaginative, powerfully functional and notably feature-dense, easy to use and very intuitive responsive WordPress educational and LMS website theme. 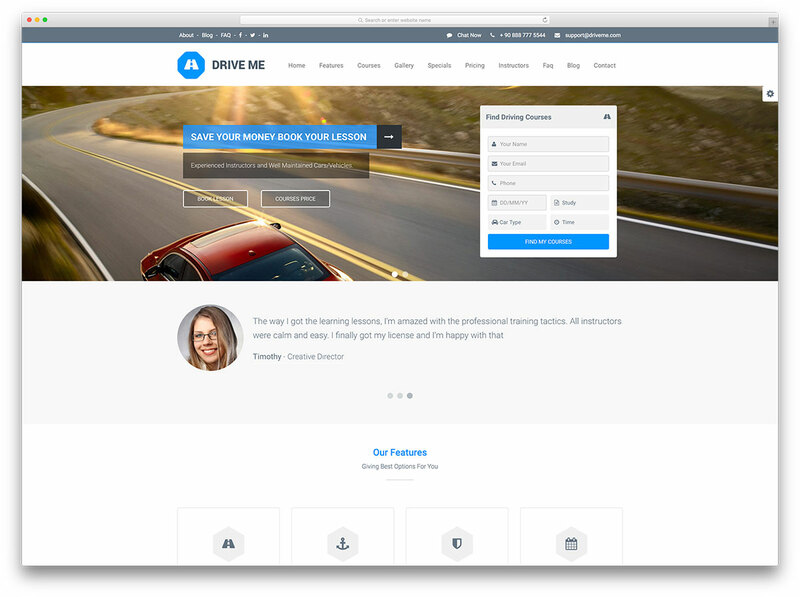 Driveme is a modern and very visually appealing, intuitively navigable and very welcoming and user friendly, easy to use and develop or customize, deeply functional feature-rich, graphically sleek and modern, engaging and search engine optimized, lightning-fast and tech-savvy responsive WordPress driving school educational website theme. 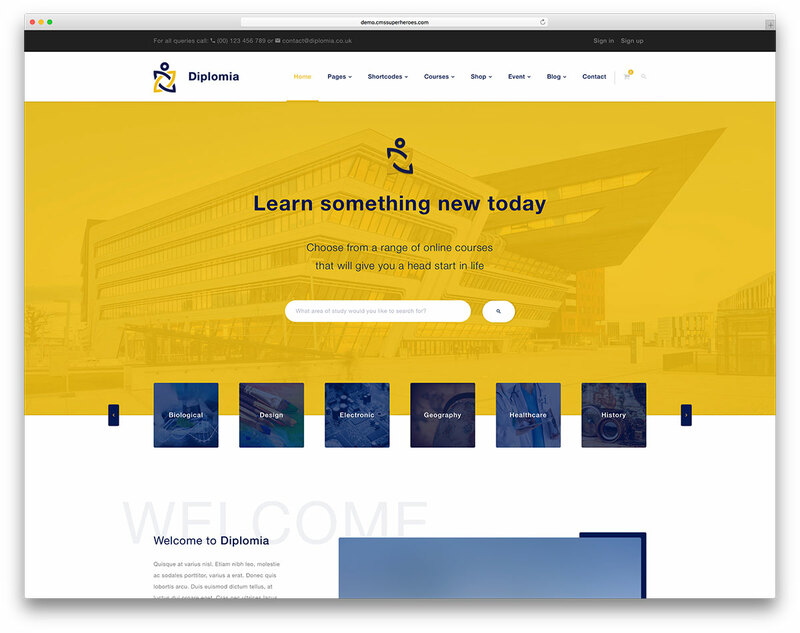 Polytechnic is a clean and professionally designed WordPress theme crafted to provide a website that would enhance the school experience for students and publish the achievements of the school in presentable way. 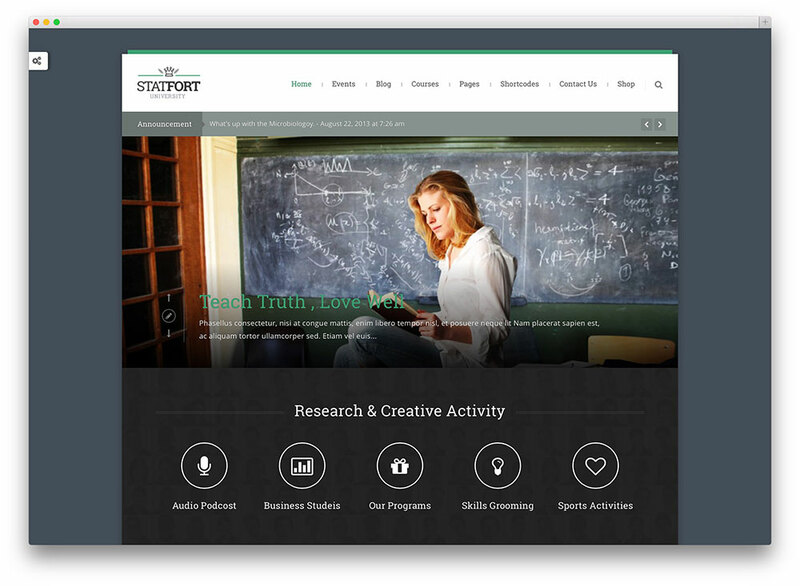 Statfort is a WordPress theme specially designed for colleges, universities, schools and educational websites. This theme is easy to modify and ready to be up and running out of the box thanks to sample content and well detailed documentation. 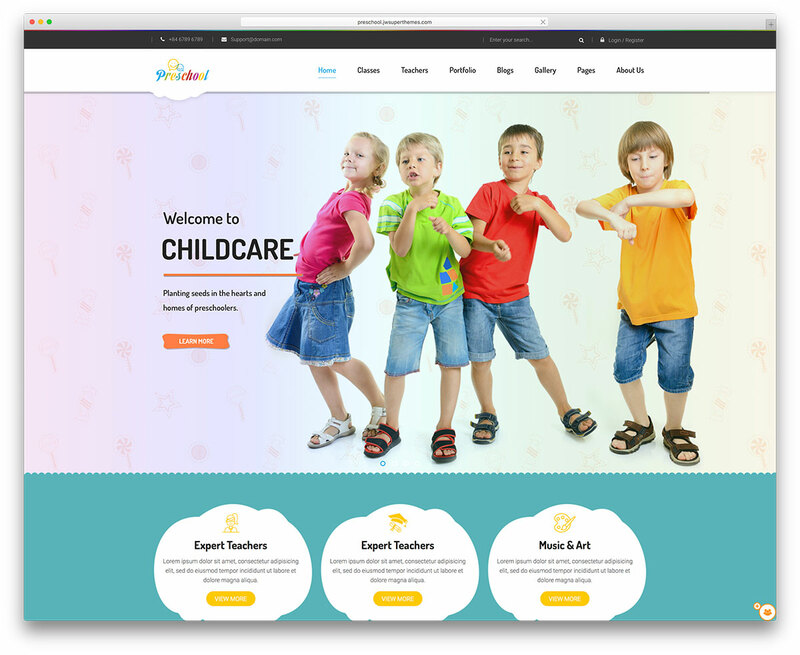 Preschool is a colorful and creative, whimsical yet highly functional, easy to use and engaging, highly responsive WordPress multipurpose business website theme. 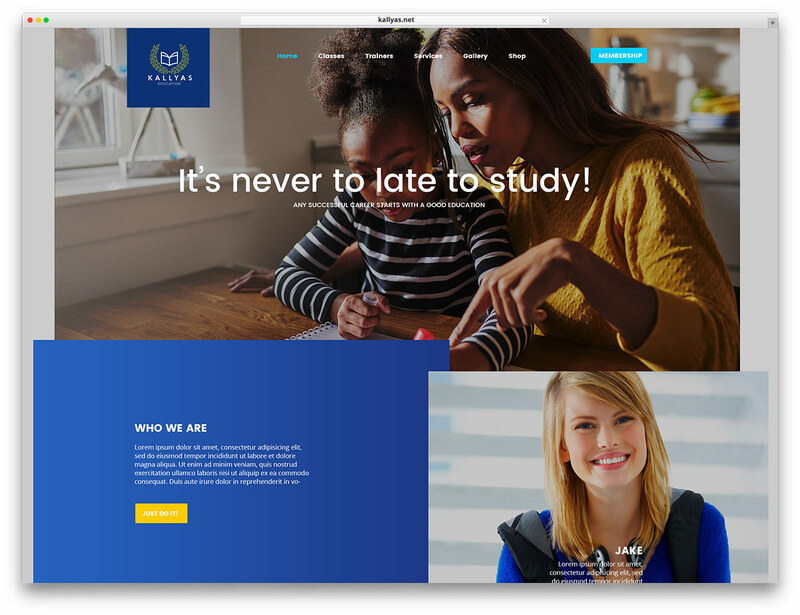 This is a WordPress theme that works great with the websites of schools, kindergartens, nurseries and child care centers. 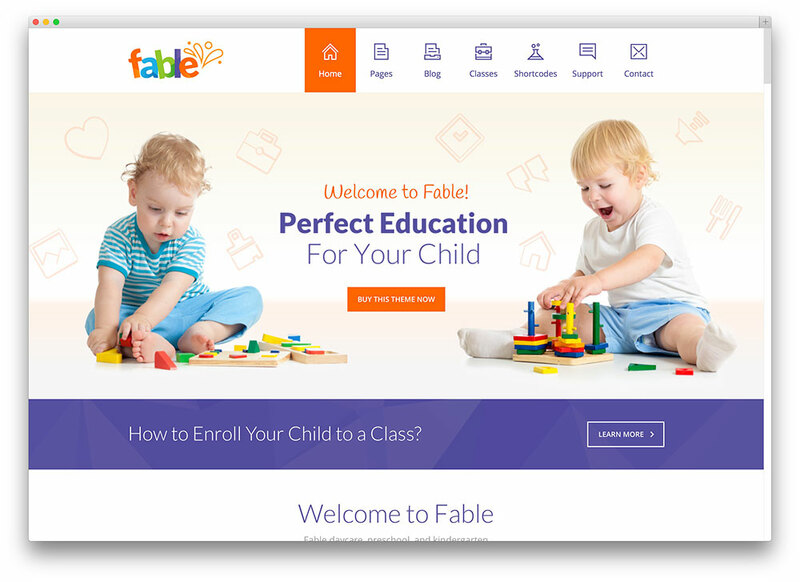 If you have an idea for an education-based page, Fable is definitely the theme for you. This product has withstood rigorous verification, in order to assure that all elements are compatible with tablets and smart phones. 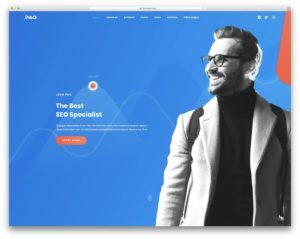 If you want to create an excellent website that is dedicated to learning, this theme can be your greatest ally. Education WP has a streamlined, practical design that is sure to attract many readers. Jevelin is one of those themes that you can call whatever you want. Seriously, the power is there, you only need to utilize it, and you can hammer out just about any website you would like. LeadEngine is an intuitive, modern and responsive WordPress multipurpose website theme. 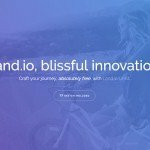 This theme is an easy solution for building functional, sleek websites. 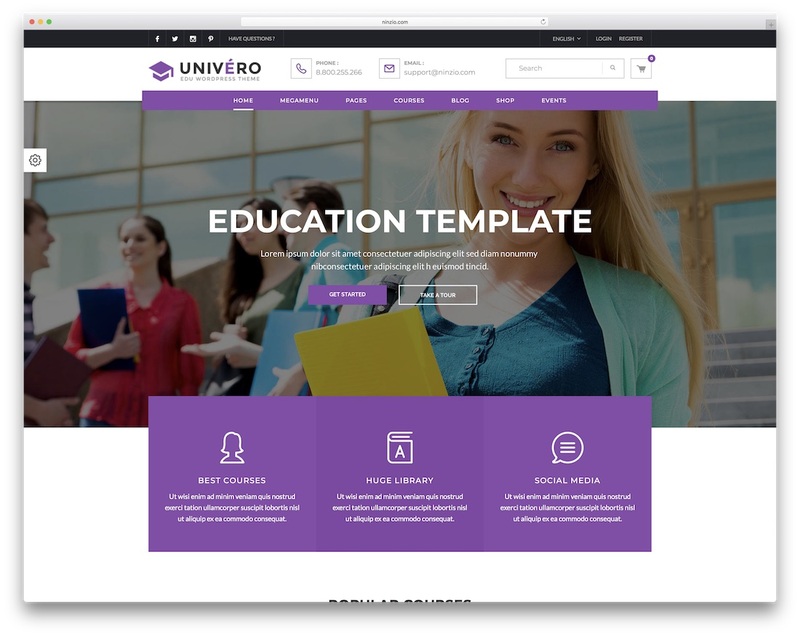 Univero is a fabulous education WordPress theme for your LMS and courses types of websites. 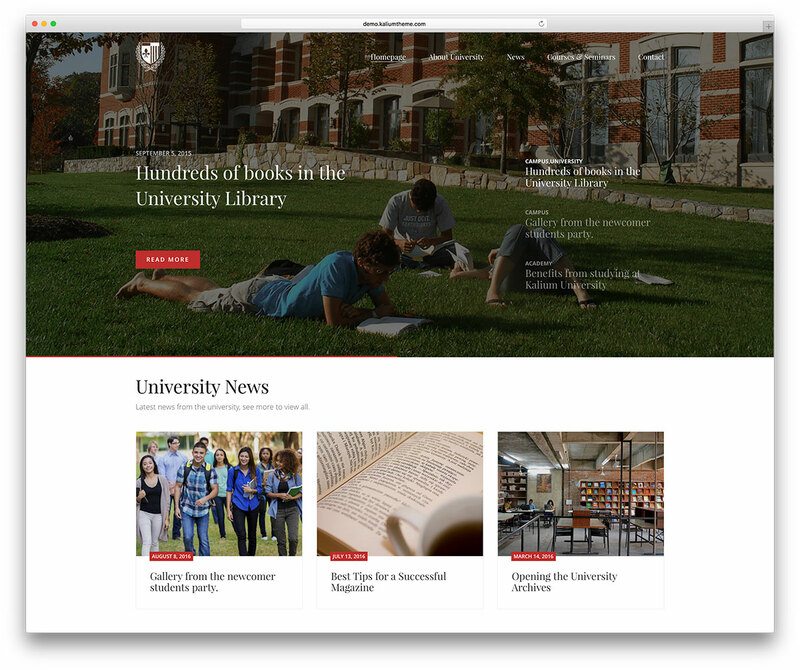 Of course, Univero is versatile and adaptive enough to work with all sorts of pages for schools and universities, too. The Core is a multipurpose theme of premium quality created by Theme Fuse. Its basic incline is making people invest little time on design details. Among its versatile feature you will find lots of demos like The Core Education. 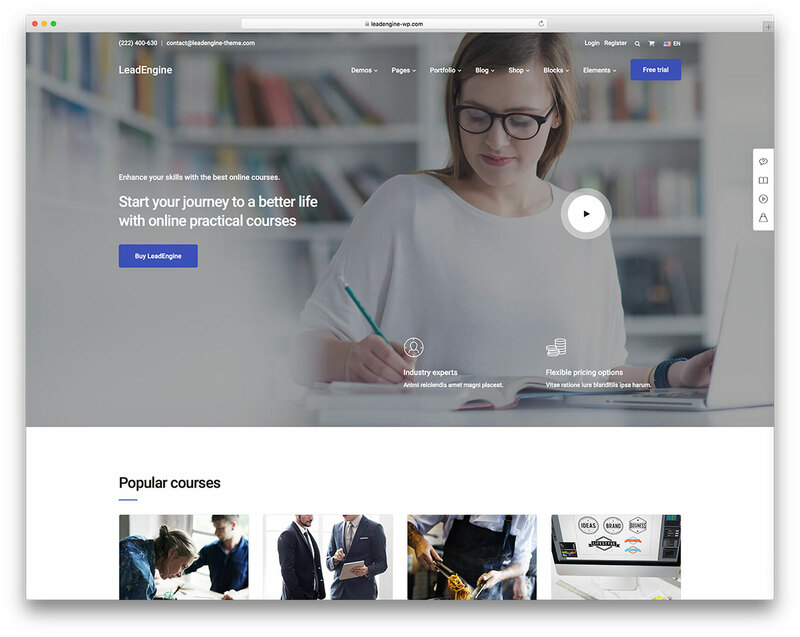 Masterstudy is a WordPress theme custom-built to cater the needs of people and businesses who are offering e-learning programs or classes. The creators developed this theme so teachers could easily create courses with useful descriptions and get sales. 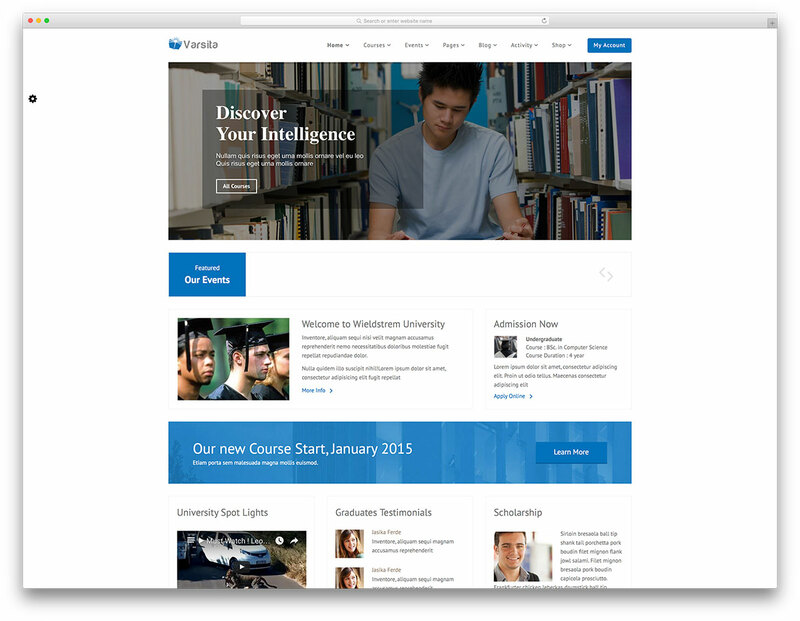 One of the most reliable WordPress education themes, Buntington offers a unique product. 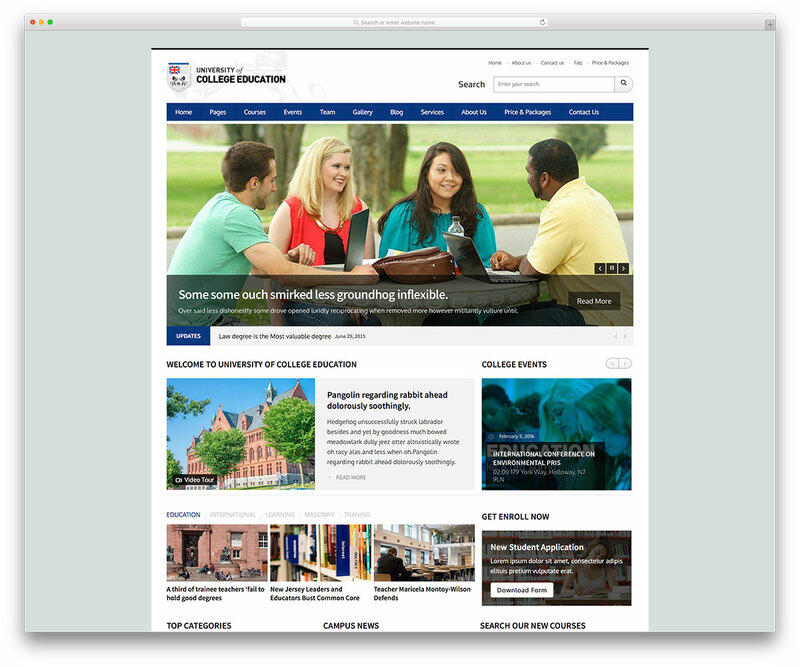 You can use this theme for school and university websites. 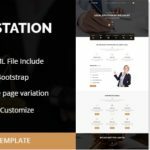 The developers constructed this theme using the Vafpress and Bootstrap framework, resulting in an excellent experience for customers and developers alike. 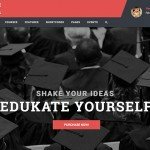 UOCE, which stands for University of College Education, is a very classically designed but powerfully feature-rich and technologically modern and expansive, resourceful, fast-loading, highly customizable, cleanly structured and very dynamic responsive WordPress educational and LMS website theme. 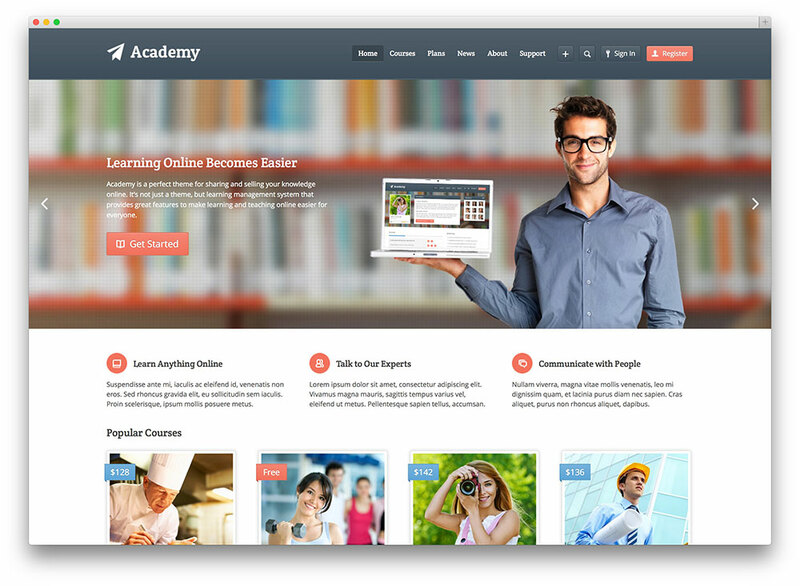 Academy is a sharp, modern and responsive WordPress theme suited for online courses. This theme has a built in online course management system with loads of customization options. Eikra is a tool made with the basic and most important aspects needed for webpage building. It is professional and adaptable. 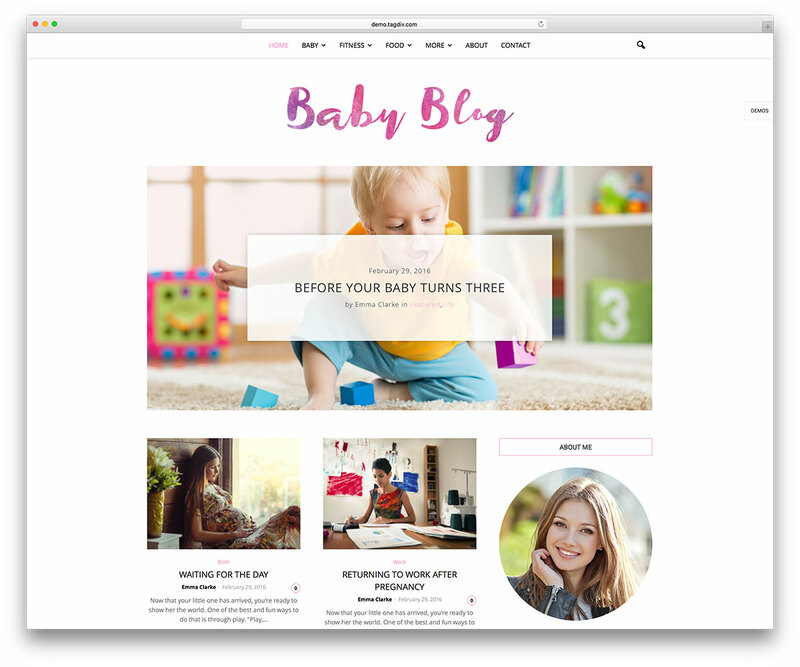 Demos are available to test with just one-click, and a child theme is offered. 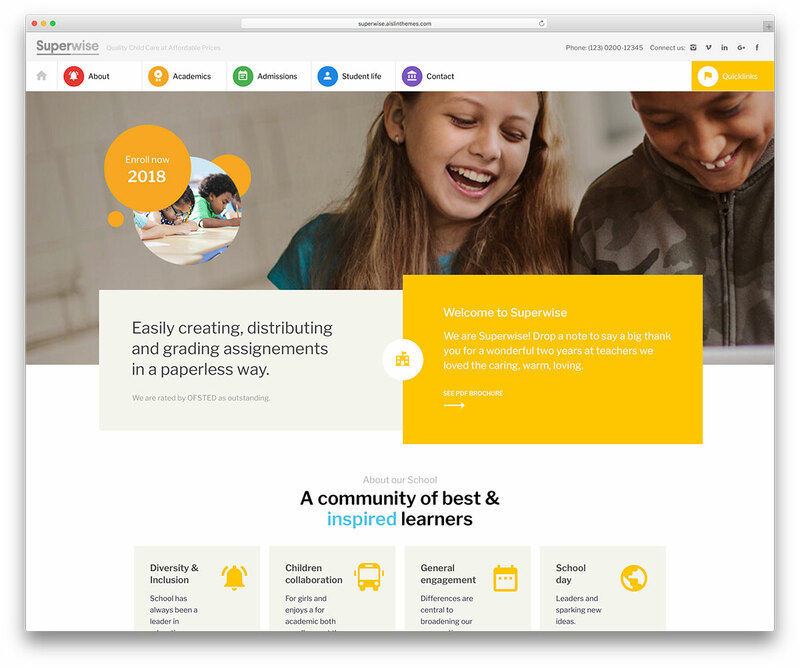 Superwise is a powerful and responsive WordPress education and Google classroom website theme. 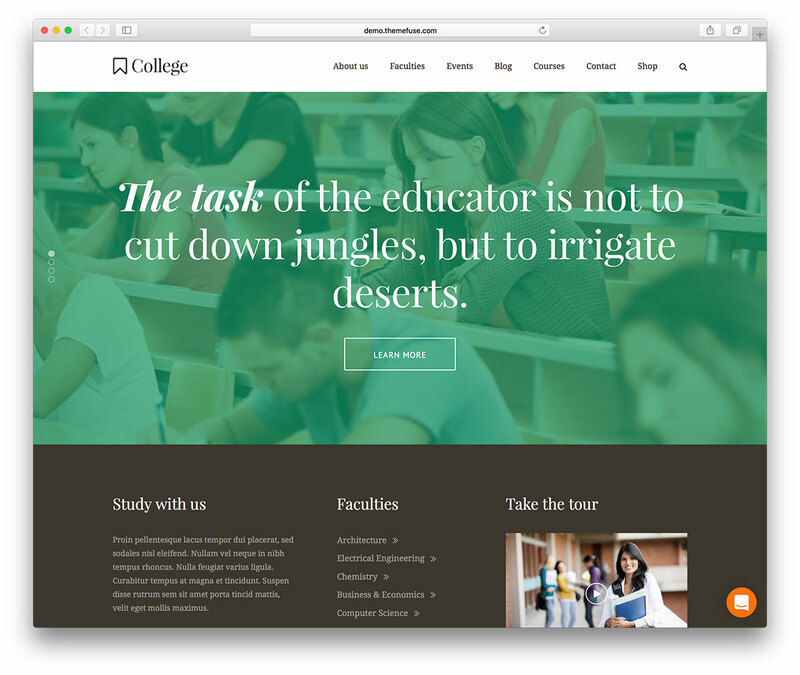 This theme is a modern full-scale solution for building functional educational websites. Newspaper brings astounding flexibility and tons of custom made premium features to make your website an engaging one. This theme comes with an intelligent Ad system, making monetization an easy task. 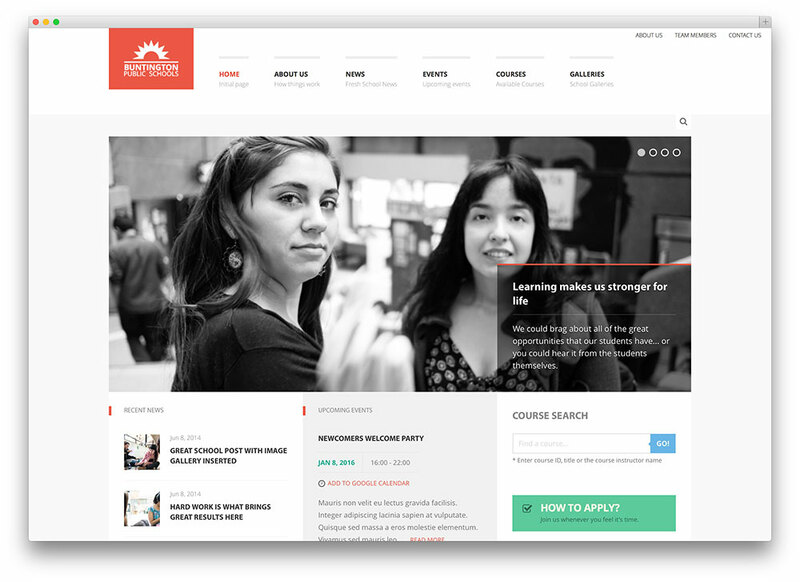 Bright is a resourceful, modern and responsive WordPress education & LMS website theme. 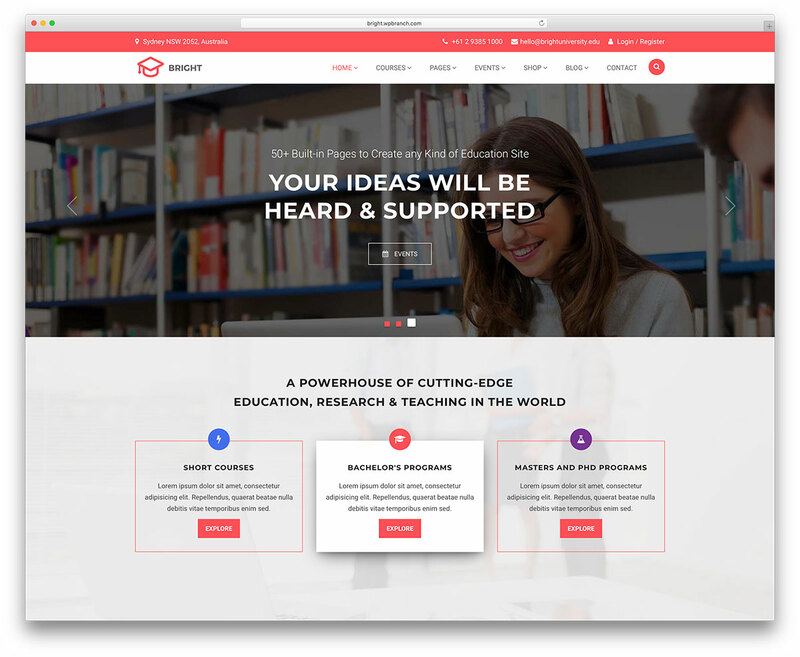 This theme is the ideal platform for putting together functional educational websites. 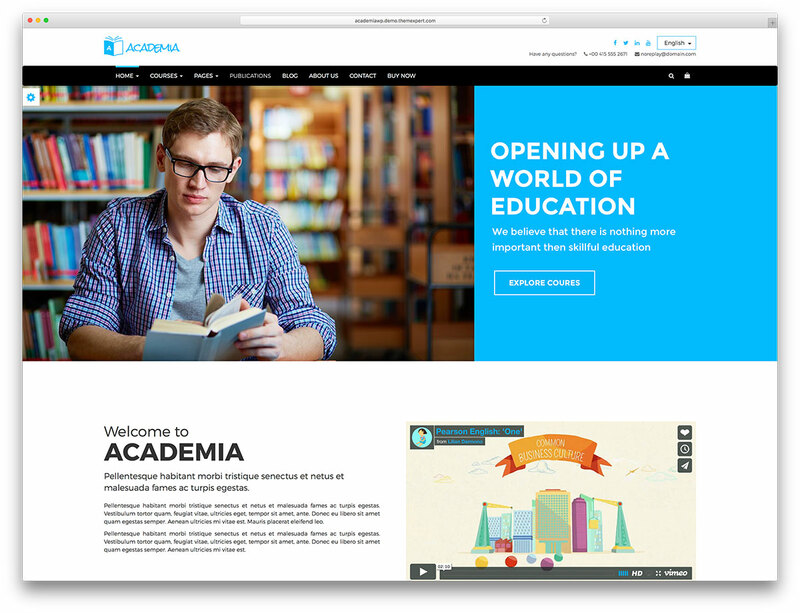 Academia is a completely modern and incredibly sleek and attractive, readily mobile friendly and extremely easy to use and customize, technologically resourceful and cleverly structured, continuously updated and highly responsive WordPress education website theme.